Nasal reconstruction is an advanced facial procedure that requires extensive aftercare. If a patient fails to take care of the nose properly after nasal reconstruction surgery, infection and other complications may occur. Dr. Babak Azizzadeh of the CENTER for Advanced Facial Plastic Surgery in Los Angeles is a globally recognized facial plastic and reconstructive surgeon. He offers instructions to help a patient take care of his or her nose after nasal reconstruction surgery. By doing so, Dr. Azizzadeh simultaneously helps patients achieve the best-possible nasal reconstruction surgery outcomes and maintain the integrity of the nasal function. For the first day after nasal reconstruction surgery, a patient should drink plenty of liquids. This helps a patient keep his or her mouth from feeling dry. Furthermore, a patient should avoid hot liquids and foods; instead, a patient should eat only soft foods and resume his or her normal diet the second day after treatment. For the first two days following nasal reconstruction surgery, a patient should keep his or her mouth clean. On the night after surgery, a patient can wipe the teeth gently with a clean, damp washcloth. A patient can rinse the mouth with mouthwash after each meal but should avoid gargling. A patient can use petroleum jelly or clear lip gloss to keep the nose moist for the first two days after nasal reconstruction surgery. Additionally, he or she should avoid blowing the nose or inserting anything into the nose at this time. Swelling and bruising are common in the first few days after nasal reconstruction surgery. Bruising disappears on its own within five to 10 days of surgery and swelling subsides within two to four weeks. Nasal reconstruction surgical stitches may be removed about one week after treatment. Depending on the severity of nasal reconstruction surgery, a patient can resume normal activities in one to three weeks following treatment. Patients should avoid rigorous exercise, heavy lifting, straining or vigorous housework for three weeks after nasal reconstruction surgery as well. This helps a patient avoid putting pressure on the nose. Clean the surgical incisions with hydrogen peroxide once a day. Use antibiotic salves on incisions and inside the nostrils twice a day. Apply a cold compress gently over the eyes and cheeks for the first three days after surgery. Following the initial three days, use a warm compress on areas that have persistent bruising. Keep the head elevated for at least one week following surgery; this should be done any time a patient sleeps, rests or relaxes. 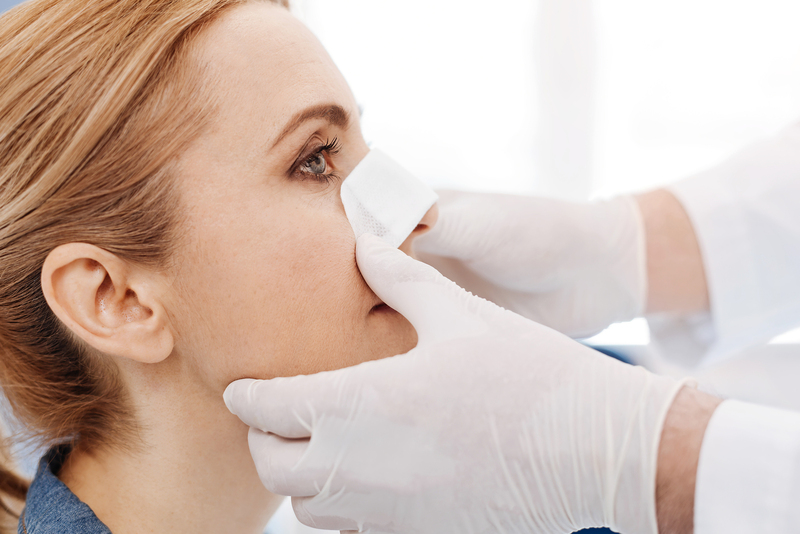 To ensure optimal nasal reconstruction results, the procedure must be performed by a facial plastic and reconstructive surgeon who has a complete understanding of the underlying structures of the head. Meanwhile, Dr. Azizzadeh is dual board-certified in facial plastic and reconstructive surgery and otolaryngology (head and neck surgery). His expertise enables him to help nasal reconstruction patients achieve their desired results. Listening to the patient. Azizzadeh takes a graduated approach to nasal reconstruction. First, Dr. Azizzadeh finds out why an individual is considering nasal reconstruction and a patient’s treatment concerns and goals. He then offers details about the least-invasive methods to address a patient’s nasal defect. Understanding the anatomy of the face. The face is comprised of 3D anatomy, and each area of the face must be treated as a separate unit. Thus, incision placement is critical during nasal reconstruction surgery, and Dr. Azizzadeh strives to help a nasal reconstruction patient preserve the 3D curvatures, form and anatomy of the face. Analyzing tissue replacement. Each layer of the nose has different types of tissue, and nasal reconstruction cannot be successfully completed unless certain tissues are replaced with tissues that have similar properties. As such, Dr. Azizzadeh sometimes grafts tissue from different parts of the body for nasal reconstruction. Preserving the nasal function. The nose and sinuses are complex structures, and Dr. Azizzadeh uses the full extent of his expertise to ensure each nasal reconstruction patient can preserve the nasal function. Dr. Azizzadeh also is available to respond to patients’ concerns and questions during the nasal reconstruction recovery process. That way, Dr. Azizzadeh ensures each patient can enjoy a smooth, comfortable recovery. To find out more about nasal reconstruction, please contact us today at 310-657-2203 to schedule a consultation with Dr. Azizzadeh.